Orphaned at an early age, Peter Parker (Toby Maguire) lived in Queens, New York with his beloved Aunt May (Academy-Awards®) nominee Rosemary Harris) and Uncle Ben (Academy Awards® winner Cliff Robertson). Peter leads the life of a normal student, working as a photographer at the Daily Bugle under the tutelage of publisher J. Jonah Jameson (J.K. Simmons), pining after the beautiful Mary Jane Watson (Kirsten Dunst) and hanging out with buddy Harry Osborn (James Franco). Yup, I'm with Mitchy on this one. Frankly the whole Spiderman franchise thus far has been shite. I can hear Rob and Mikey getting all furious as I write this, but so be it. Mikey, we're all entitled to our opinions obviously, but 4 STARS??? Are you insane??? You're putting this up there with both X-men movies and Batman Begins??? 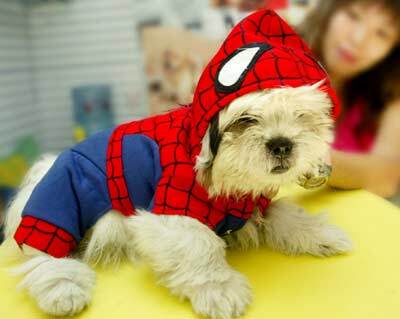 I didn't like the second Spiderman film, but you gave it 4 stars too - is this one just as good?? 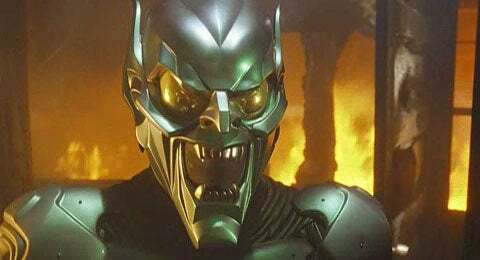 I mean, surely YOU didn't like the rendering of the Green Goblin, nu? I REALLY REALLY enjoyed the movie when I saw it in the theatre with Roberto and Ogre. I wasn't clicking my heels when they made the Green Goblin more armour than organic, but that was a minor flaw on a spectacular film. Given all the cheese-whiz renditions of Spider-Man in the past, this was a clear stand-out in that it not only made Spidey believable but also kinda cool looking. The past renditions always looked like a man in cheap underoos. The scenes where he's testing his power are charming and funny. The scene at the locker where he dodges all of the bully's blows is still up there amongst my favourite scenes in recent history. Kirsten Dunst was a stellar Mary Jane and that kiss in the alley-way with that......sweater. THAT gives it a bonus star right there! The second one was even BETTER in that they cleared away most of the "rubbery" look to the CGI bouncing around. The third one is helmed by a different director and has MORE villains, which always takes time away from the story (to tell back-stories, powers, etc.). I mean, you have the Lizard, Man-Wolf, Sandman AND potentially Venom (though Topher Grace has since disappeared from the roster). I'd give Spider Man 2 MORE than 4 stars relative to this one, but I can't so they BOTH get 4 stars. Well, I loved this movie, too. It was a nearly perfect Spider-Man film. I've got to take away a half star for the Goblin armour, simply to maintain my rep as a comics purist, but otherwise, it was an awesome, awesome film. Now it's my turn.... LAME! Don't remember much of it, only that I was pretty disappointed. Oy.....c'mon Deril,this movie was a dog! "Oh, it looks good on YOU, though!"